Slow PC? Frustrated? Then we will help you. You can make it faster without using any software or PC-Booster! This post is totally based on inbuilt file creation by Windows that grab a lot of your Hard disk space. 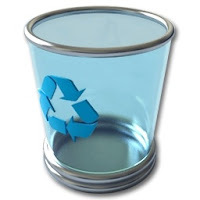 It is the recycle bin which is eating most the spaces of your hardisk if you dont vacant it regularly. To empty, just right click the Recycle bin and Click “Empty Recycle Bin”. You are now inside the temprary files folder. Delete permanatly by selecting all and pressing Shift + Del. Some files would be used by some processes, so you can leave it and delete afterwards. Delete all the files here. As we know C: is the drive where whole Windows platform is based (Except dual booted system), so try keeping less files on this drive. Try installing Games or Programs in any other drive. Here we are, one the biggest space grabber for Windows! 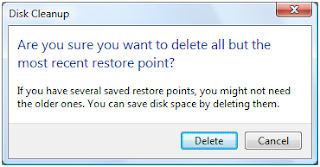 Restore points are made automatically so that we can restore the system to previous date when the Windows is either infected or damaged. When your PC is safe and not at all infected, you can delete the old restore points and create a new one. Right Click on My Computer icon and select properties. Click on System Restore Tab. 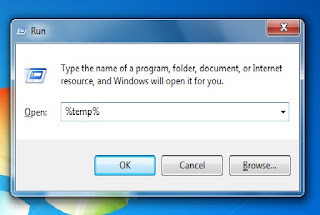 Now check “Turn off System Restore in all drives” and press Apply. Once it is applied, uncheck the box and press OK.
1.Goto Start > Programs > Accessories > System Tools > System Restore. 2.Type the name of the restore point (whatever you want). The restore point is now created. And you see how much space you have gained after this. I gained about 13 GB of space ! Now click on Startup tab. Now uncheck those programs which you think are useless to be put into startup. When your RAM is not enough, your PC resorts to using the free space found on your hard drive in order to deal with data overflow. This free space that is used is called virtual memory. You can change its value to trick the programs that require perquisites for a certain memory. It plays major role in terms of performance. Increasing the size of your virtual memory is relatively easy and requires no special downloads. Right click on Computer icon and select Properties. Now change the maximum value a bit and initial value too. If you have 1000 MBs of RAM, make your Virtual Memory size 1500 MBs. Good trick to know is to make minimum and maximum paging file size the same value. This will keep your PC from constantly changing your Page file Size and keep its performance more stable. Digeus I recommend it when windows hangs, chashes or works slow. I also recommend Windows Tune Up Suite form Windsty. It cleans your computer from problems.